I’m not much of a baseball fan. I know just enough to keep up my end of a conversation about the generalities of the game. My sister, on the other hand, is a die-hard Boston Red Sox fan. Really, by her request, she and her husband went to Fenway Park for a game on their honeymoon. It’s a long story for her going back to playing checkers with our grandfather, while listening to the Red Sox on the radio. In the blog entry here, you can read about a quilt moving a tough baseball player, Joe Torre formerly manager of the NY Yankees, to tears. He sponsors a foundation to help at risk school children in NYC who are living surrounded by violence. As a thank you to him and in recognition of the 10 year anniversary of the foundation he sponsors, a group of at risk students made quilt blocks which were assembled by Victoria Findlay Wolfe. Our upcoming seminar teacher, Pat Sloan, also had a part in making this quilt happen. Amazing, isn’t it, what a “blanket” can do? I stole that title from the blog post I’m going to talk about. You know I like scrap quilts if you have read most of my blog posts here. There’s just something about the interplay of the colors and values, and I enjoy imagining where the fabrics came from. What is the story of the quilt? Even though I have made several, I’m not always happy with the colors in my own scrap quilts. I’m getting better, but I have a way to go yet. I’ve learned that smaller pieces are better. I like a quote I read at Bonnie Hunter’s blog (Bonnie will be our 2014 seminar national teacher) “If it’s still ugly, you haven’t cut it small enough.” Truly random placement of the colors works better for me than attempting to have a plan. (Very hard to do for a retired math teacher!) Lots of textures-plaids, strips, polka dots, florals- also helps with the overall appeal. Kind of like making minestrone–just look in the frig and find more to add to the basic stock. The soup will be delicious…and your quilt with all of its colors and textures will be great. This blog post about the author’s own scrap quilt rang a bell with me. I too have found that scrap quilts get better looking as you add more and more variety to the pieces. At the start they are just plain ugly. I’m going to guess that many quilters who have begun scrap quilts and quit after a few blocks or rows, just quit too soon. If there is the beginning of a scrap quilt in your UFO stash, how about dragging it out and continuing to add to it now and then this year? If you quit too soon, add more to it. If your pieces are too big, how about slashing it? Or something like the disappearing 9 patch technique? Maybe by the end of the year, when it is a true chronicle of your quilting projects, you’ll be happier with it. I also have found that when I’m all done with the binding, a good wash and dry in the dryer to give it that soft crumply “old quilt feel” does wonders for scrap quilts. Worse case? You’ve made a quilt for charity. And that’s not a bad thing at all. Found a video on YouTube by that name. It actually is from the New England Quilt Museum. A new intern there has made 2 videos about the museum, one serious and this one not so much. Is this what your relatives think about quilts? Check it out here. You’ll find a link to the serious video there as well. 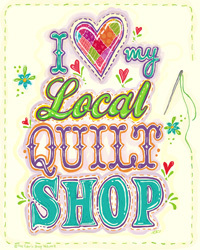 Thursday, January 24th is National VISIT YOUR LOCAL QUILT SHOP DAY!!! Yes, yes my friends – we need to go visit, shop, have fun – and it is all legitimate and justified!! YAY!! So – GO, GO, GO! Have fun and take some pictures!! Of course, if you are not into all those social media (Facebook, Twitter, Instagram) in order to submit you contest entry – feel free to send them to me (vujcicms@hotmail.com ) and I will be happy to submit them for you! (just send them by about 11 pm, deadline is soon after). Hey, maybe we can have a little contest among ourselves here, with some blog candy/giveaway? Hmmm…not a bad idea! What do you think? In any case, the point is to celebrate our local treasures. Picture above is the official poster, you can find it and print it here . Many quilters use it to take a picture with that, in their local shop – really fun! Hope to see you Thursday night in our local quilt shops wanderings! Have you visited the Craftsy site? You really ought to. Although it is free to join, you don’t have to be a member to visit much of the site. There are all sorts of goodies to explore. As a crafting addict I have supplies for more crafts than I’ll ever be able to complete in several life times. I’ve tried so many things. I think I can name the crafts I have NOT tried in a shorter list–stained glass making, pen and ink drawing, sculpting, glass blowing … Right now at Craftsy I am taking an online class taught by Anita Grossman Solomon, who was our national seminar teacher last fall. I was only able to take one class of hers during seminar and I really enjoyed it. Haven’t finished the project of course. The block I made in seminar, the pineapple block, is one she will be teaching in this class as well so I’m hoping to get motivated to finish up that project. But I’m also learning so many tips and tricks separate from the projects themselves. Love her starching tips, and I am in total agreement with her pre-washing philosphy. I have had a few catastrophes with dye running (red and blues) and some uneven shrinkage issues with fabric I did not pre-wash. Sometimes surprises are not a good thing! If you weren’t able to take a class from Anita at seminar, or you want a review, or more information you might try this online class. It’s on sale right now, and you will have lifetime access to it once you have paid. How about Pinterest? Do you have some favorite boards to visit there? Talk about a time waster! Not a waste in that it has no value, but time surely goes by unnoticed as one explores. There is so much to see that hours, literally, can easily be consumed just going from board to board. Whether you like cooking, jewelry making, painting, kids crafts, and on and on–you will find something of interest. Here’s a link to the Craftsy quilting boards at Pinterest. Go have a look! I love scrap quilts. I’ve made several-4 or 5 large ones, and many minis. I love the interplay of the seemingly unrelated patterns, the focus they put on values rather than individual fabrics. I can’t say where this interest comes from. Although I do come from a long line of needleworkers–my first quilt was made for me by my great-grandmother–all of those quilts in my background were planned fabric assortments. The really early ones are made of solids. The current episode on Quilters Newsletter TV (a free video compilation) is an interview with Pepper Cory about her feelings on the importance of scrap quilts in helping to maintain our history and quilting tradition. It’s about 10 minutes long. Pepper has been a “name” in quilting for quite some time. Back when I began quilting in earnest, in the 80’s, there were only a few “names” around. It was so unlike today when new designers are popping up all of the time, and bazillions of quilters have their work on the internet. In those early days if one needed advice, instruction, or inspiration, finding it involved a search. Pepper’s books were among those one could count on. I agree with some of her thoughts about the latest fabric collections, and making quilts from them. See what you think. Put yourself into your quilts. See if Pepper’s words inspire you to bring an “ugly” family quilt out of the closet and onto the couch or bed. The half square triangle is really a quilting work horse. So many designs, from simple to complex, incorporate the HST. I ran across this idea today for taking your HSTs up a notch. It’s kind of like putting a piping or flange along that diagonal seam. This definitely is an idea to file away for future reference, but if you’re like me… don’t forget where you filed it! Here’s another classy HST. She calls it a cathedral window remix–let’s say it’s a hybrid of the two. Again an idea to remember for those times when you want to make a basic block look snazzy. It’s time for me to get off the computer and go get some work done. TTFN!